TODAY’S AUTOS OEM THERE IS ONLY “TOE (DIRECTIONAL) ADJUSTMENT – NEW CAR INDUSTRIES BEST KEPT SECRET (AND EXTRA WIDE ALIGNMENT PARAMETERS TO COMPENSATE)! K-MAC THEREFORE SAW THE NEED AND HAS REINSTATED A WHOLE NEW GENERATION OF REPLACEMENT “ADJUSTABLE” BUSHINGS (SEE “ABOUT US”) – UNIQUE PATENTED SINGLE WRENCH, FAST, ACCURATE ON CAR (UNDER LOAD) DIRECT ON ALIGNMENT RACK! CAMBER : ALLOWING TO CHANGE TIRE CONTACT ANGLES finally resolving costly, premature edge tire wear and improving traction. On TRACK DAYS can adjust to reduce understeer or oversteer. Also see “CASTER” adjustable bushings. FINALLY RESTORING ONGOING ADJUSTMENT FOR OTHER THEN SHOWROOM HEIGHT CONDITIONS – DAY TO DAY COMMUTING – Encountering high cambered roads, altered height through load carrying or lowering, fitting wide profile tires, worn bushings or curb knock damage. K-MAC SYSTEM REVOLUTIONIZING HOW ADJUSTMENT IS MADE – now no more (what has plagued the industry for more than 40 years) – the labour and time consuming need each time an alignment change is required – the removal of bushings and the inaccurate trial and error repositioning to a new setting. NOW PRECISE “SINGLE WRENCH” ON CAR ACCURATELY (UNDER LOAD) DIRECT ON ALIGNMENT RACK. Replacing the 2 front lower control arm inner bushings. Designed for absolute maximum adjustment range. 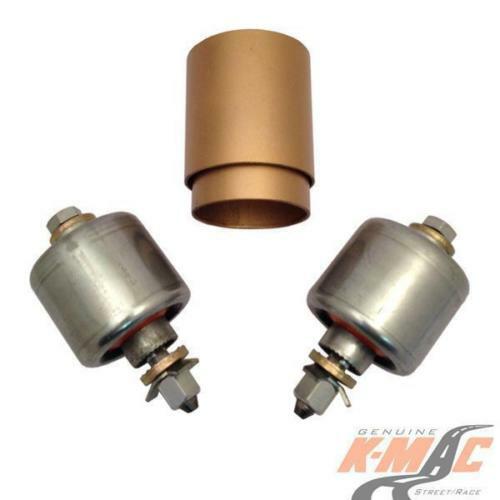 K-MAC “fail safe lock system” and bush extraction / insertion tubes included. 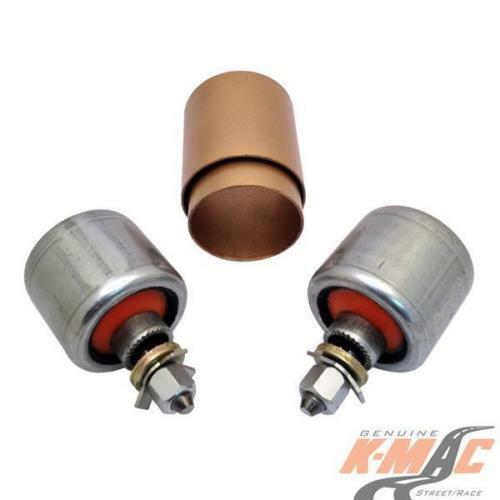 CHECK LIST / EXTRA FEATURES K-MAC BUSHES VERSES OTHER BRANDS : Where other brands merely replace “OEM rubber bushes with urethane to eliminate the OEM oil and air voids in the endeavour to improve brake and steering response. The problem here is that with today’s autos multi link arms and different mount angles, this inhibits the suspension arms travelling through their required arcs which can cause even more wheel tramp / loss of traction with arms binding, locking up and lead to breakage! eliminating the OEM oil and air voided rubber bushings for improved durability and also steering response (the unique design superseding short life spherical bearings having more then 2.5 times the load bearing area). ON TRACK DAYS : ABILITY TO DIAL IN “EXTRA NEGATIVE CAMBER” TO SIGNIFICANTLY REDUCE UNDERSTEER, in the pursuit of hitting those corner apexes every time and allowing to go deeper into the corners with increased traction and braking response. With the result of further lowering lap times in the quest for front row of the grid on race days! 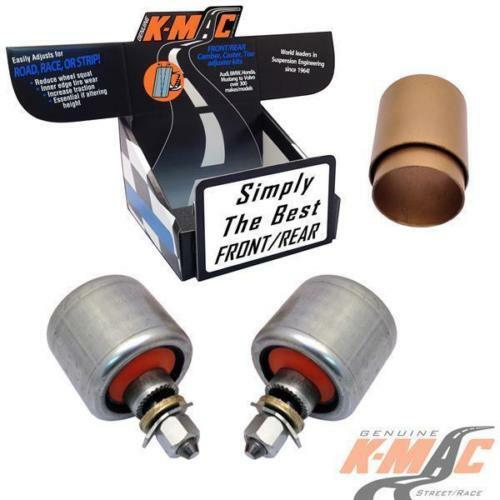 *ALSO SEE COMPLETE RANGE OF K-MAC REAR BUSHINGS – CAMBER (AND EXTRA TOE) ADJUSTABLE. Precise single wrench on car accurately under load – moving bottom of tire inwards (or out for extra track width) unlike rear upper Camber arms that are difficult to access / adjust and need to reduce important clearance “top of tire to outer fender” when wanting to prevent premature inner edge tire wear.